(CN) – A company that provided its proprietary maps and software to a hunt for sunken treasure off the Florida coast was wrongly denied its right to intervene in a case involving 400 pieces of gold and other artifacts retrieved from the wreck, the 11th Circuit has ruled. The sunken treasure and artifacts are all that remains of a Spanish fleet of 11 vessels that sailed into a hurricane during the pre-dawn hours of July 31, 1715, seven days after they departed for Europe from Havana, Cuba. 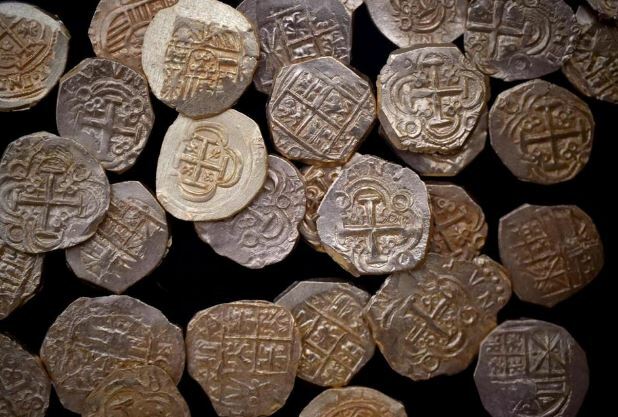 In the 302 years since then, gold and silver coins and other remnants of the fleet have occasionally washed up near Vero Beach, Florida, but the exact location of the 11 ships has largely remained a mystery. The mystery has been compounded by the fact the vessels sank in the gulf stream. As result, some of the wreckage is believed to have literally been pushed up the coast by the strong, persistent current. And what hasn’t been washing toward the Georgia/Florida coast, has been covered over with sand and silt. In 1979, the Cobb Coin Company retried a cannon from the wreckage that was later confirmed to be from the 1715 fleet. Three years later, the company was awarded exclusive salvaging rights to the shipwreck and a federal court continues to this day to hold a yearly distribution hearing to adjudicate title to the recovered artifacts and allow competing claimants to be heard. As recounted in a July 5 opinion from the 11th Circuit, in 2010, Cobb Coin Company’s successor-in-interest assigned its exclusive salvaging rights to 1715 Fleet-Queens Jewels, LLC. By then, the shipwreck was spread over about 41-miles of the sea bottom, and Fleet-Queens hired subcontractors to assist in its salvaging operations. One of those, Gold Hound LLC, claims in court documents that it provided proprietary maps, data and software to the effort. In 2013, the court documents says, Fleet-Queen sought to renegotiate its contract with Gold Hound, and when the subcontractor refused, the contract between them was allowed to lapse. In 2015, the 11th Circuit panel says, Fleets-Queen recovered 400 gold coins and other treasures from an area Gold Hound had allegedly been salvaging before the contract disagreement. Gold Hound then sought to intervene in the 2015 distribution hearing, asserting a maritime lien over some of these artifacts and several state-law claims. It also claimed Fleet-Queens mishandled the artifacts in violation of the district court’s 1982 order, and challenged whether the federal court continues to have subject-matter jurisdiction over the case. But the district court denied Gold Hound’s motion to intervene, prompting its appeal to the 11th Circuit. Writing for the three-judge panel, U.S. Circuit Judge Stanley Marcus said “after review, we conclude that the district court properly determined that it had and continues to have subject-matter jurisdiction over the res. “However, Gold Hound should be granted leave to intervene in this proceeding to assert its in rem claims,” he continued. “On remand, we leave it to the district court’s sound discretion to determine whether to exercise supplemental jurisdiction over Gold Hound’s related state-law claims, including, inter alia, its claims for breach of contract, misappropriation of trade secrets, breach of fiduciary duty and constructive trust, and tortious interference. Representatives of the parties did not immediately respond to Courthouse News’ request for comment.